Tefal Ingenio, the multifunctional Cookware range with a easy to use removable handle system allowing you to switch pans in one click. The versatile pots and pans that stack inside one another saving you up to 40% space in your cupboard. 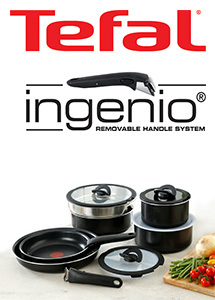 You can handle it with Tefal Ingenio.